*Longer coverage periods with other benefits available through Suzuki Extended Protection (SEP). Large Mikuni 40mm carburetor provides a smooth intake flow and quick throttle response. The stainless steel exhaust system is light and corrosion resistant and is tuned specifically for strong low- and mid-range power. Easy-pull, rack-and-pinion activated clutch provides precise operation and feel. Innovative, height-adjustable* front fork provides smooth and progressive action. Large diameter, thin-walled tubes reduce unsprung weight, while maintaining high rigidity. *Seat and suspension height is adjustable by your Suzuki Dealer, using a Genuine Suzuki Accessory kit. Front and rear suspensions provide generous 260mm (10.2-inch) wheel travel for superb performance over rough terrain. The wheels are fitted with 90/90-21 front and 120/90-17 dual-sport rear tires that offer excellent on- and off-road traction. A fully equipped lighting system comes with a bright 60/55-watt halogen headlight. Seat height may be lowered by 40 mm (1.6 inches) using a Genuine Suzuki Accessory kit. The kit includes a shorter side stand to match the chassis height adjustment. Further seat height reduction is possible with the fitment of the Suzuki Accessory low-profile seat. *Seat and suspension height is adjustable by your Suzuki Dealer, using a Genuine Suzuki Accessory kit. 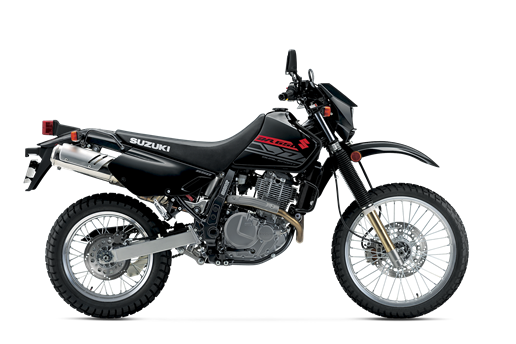 Other Genuine Suzuki Accessories include a cargo rack and skid plate, and a selection of Suzuki apparel is available.